Why do we as a campaign talk about the ‘right’ to protest? There are those on the left who see any talk of rights as a concession to reform, to the law. But to a certain extent, we have to protect what we have in the here-and-now, and make use of legal advice, even while we support the struggle for a better world. Campaigning around a ‘right’ to protest helps us draw up a clear picture of what is and isn’t permitted, and to draw attention to those points of tension with the state where protest becomes most effective. We also need to understand how the law works, and what rights we do have, in better order to protect those who find themselves on the wrong side of the state. As a campaign we strive to make the limits of our ‘democracy’ clear to all those who have an interest in preserving the rights we still have, but which are being eroded under years of Conservative rule. To defend the right to protest is both an abstract, political demand and an immediate, practical urgency. 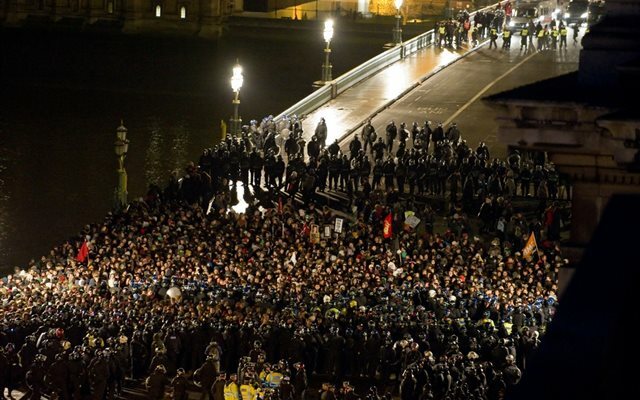 We should note at the outset that in the UK there is no unconditional right to protest. Article 11 of the Human Rights Act (1998), based on the European Convention on Human Rights, states that ‘Everyone has the right to freedom of peaceful assembly’. However, this right is a ‘qualified right’, which means that protest and freedom of assembly can be curtailed if the limitation is prescribed by law, is necessary and proportionate and protects the interests of national security or public safety, the prevention of disorder or crime, the protection of health or morals, or the protection of the rights and freedoms of others. This means that in practice, the state and the police can impose a variety of restrictions on demonstrations. We have seen this on a variety of occasions over the years, where the state has called for bans on protest, or imposed strict conditions on routes, the wearing of face-coverings and so on. But in a broader sense, what are we fighting for when we campaign for a ‘right’ to protest? First and foremost we are campaigning for protestors to be treated with the respect they are due. We are campaigning to help them defend themselves and get their stories out when the state and the police have behaved in unjust and violent ways. We are fighting for the principle of freedom: not so that things may carry on as they are, but so that things may change for the better. The history of civil rights and acceptance has always begun with and in protest. We know from experience that, where it can, the state will seek to bury the message and punish protestors whenever people ‘step out of line’. We will use the law, and legal defence, wherever we can to defend this fundamentally important act of freedom and the people that use it to make their voices heard.